This is a very quick and simple recipe so you can have a tasty treat any time you feel like it, without having to spend ages making it first. Place the oil, garlic and parsley in a blender and blitz vigorously. Leave to stand for 30 mins or so if you want a more strongly-infused flavour. Pre-heat your grill to a medium-high setting. Brush a flour tortilla with the oil, garlic & parsley mixture, sprinkle on some sea-salt flakes and place onto a baking tray. Place the tray under the grill and allow it to grill until crisp and golden/brown in parts. Remove from the heat and cut (using scissors) into slices. Serve immediately. 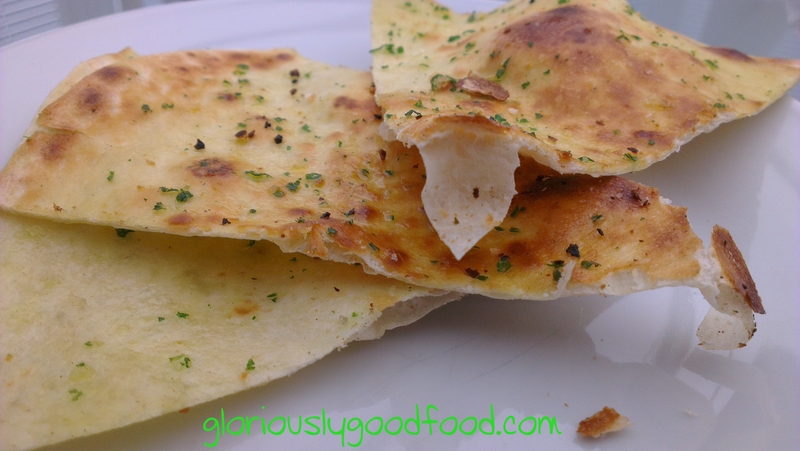 Tortilla Garlic Bread | Gloriously Simple, Gloriously Good! Looking for ideas for pancake fillings this Shrove Tuesday? For the batter recipe and how to cook the pancakes (or crêpes), go to my previous post and the video recipe. Heat up the olive oil and butter. When they start sizzling, add the sliced pork, season with salt and a sprinkling of cocoa powder. As the meat starts browning, add a few cocoa nibs (not too many or your filling will end up bitter-tasting). Continue to brown, then splash on some red wine. As the wine bubbles, turn the heat down and add a little bit of cream. Simmer for a few minutes until the cream has thickened a little. Tip: If you make this in advance, before the pancakes are cooked, don’t add the cream until you re-heat the filling. Thinly slice the red onions. Heat up the oil and butter and, when they’re sizzling, add the onions. After a couple of minutes, add a light sprinkling of white sugar (approx. 1 tsp for 3 onions). Turn down the heat to medium and cook, stirring occasionally, until the onions have caramelised to a sweet and slightly crunchy texture. Meanwhile, cut the cheese into little squares – if you’ve let it soften enough, it will almost turn to a spread-like consistency as you’re cutting it. This will be perfect for melting onto the pancakes. When the pancakes are ready, place some onions and cheese in the middle of each pancake (make sure they’re still hot), then fold into a fan-like shape (see video). You can use smoked salmon trimmings for this recipe; this keeps the cost down and saves you on having to cut up the salmon yourself as the trimmings tend to be in very small pieces. Place smoked salmon and cream into a pan, heat and simmer until the cream thickens and tastes deliciously salmon-y. If you do this in advance, re-heat gently before serving. So, here you go, three more ways to enjoy your savoury pancakes / crêpes this pancake day 2014. Pancake Day – Gloriously Simple, Gloriously Good!